Dinner for 4 Saturday night at Reba and Pancho's: A Modern American Restaurant. Everything was delicious, but the biggest hit was their Quinoa and Spinach Salad. 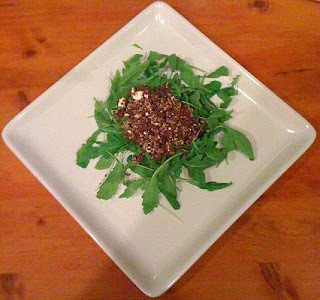 The recipe includes cold Quinoa tossed with Feta, Red Onion and a vinaigrette, served over baby spinach. We didn't realize the vinaigrette was there until we asked how it got such a great flavor. It was so good that I came home today and created my own adaptation. New Orleans is, hands down, my favorite city in the United States. Thus, I return and return and return. Here are a few highlights from my most recent visit. Louis Armstrong International Airport now boasts an Acme Oyster House outpost. Having a bit of time to wait for the arrival of one friend, we took the opportunity to grab drinks and a quick snack. On the menu is a sampler of fresh and fried oysters. I've been a fan of fresh oysters since my first trip to Key West, but having their succulent fried oysters was a new and unexpected treat. The waitress there might call you honey, and she might also then apologize and explain that she doesn't mean anything by it. If you take enough offense at being called honey to complain, New Orleans is probably not right the place for you. Fortunately, my party delights in being addressed so warmly. We were famished when we arrived in the French Quarter and so we hiked down Decatur Street to Café Maspero. Rather, I think I dragged everyone, continually saying, "It's just one more block! It's on the corner." The Roast Beef sandwiches they serve are something to dream about, but this time I ordered a Shrimp Po Boy and went overboard to add a cup of Beans and Rice. The portions are beyond generous and beyond delicious. We also shared a Muffaletta, a New Orleans classic sandwich heaped with Italian meat, cheese and olive salad. A word of caution about all Muffaletta's: eat what you can in one sitting, but don't save the rest for later. Trust me on this. When recounting our day over the phone to a friend that lived in New Orleans for several years, he replied "That's my favorite place!" Café Du Monde was our next stop. Though it is a favorite, I had to be dragged this time, feeling I couldn't eat or drink another bite but knowing it would be impossible to resist a Café Au Lait and Beignets. The place was packed, the music was grand and the fare was indeed irresistable. A more the perfect spot for people watching never existed. This video captures the every-day vibe at Café Du Monde very well. Along the way we stopped to look at the art hanging on the wrought iron fence at the Place D'Armes - Jackson Square. One friend has a thing for fancy chickens, and picked up a brilliant piece of original art painted on wood recovered from the 9th Ward. The artist picked this particular rooster especially for my friend. After we paid he told us why he choose to paint roosters; during slavery ailing roosters were often given to slaves to butcher and eat, but instead they would nurse them back to health and the result was a stronger and more robust animal. His roosters are a symbol of the greater strength being developed in New Orleans while the people there nourish this city ravaged by hurricane and flooding back to health. He also related how school kids had collected the wood for him, while he was taking extra time to work on a mural for their school. While painting he was worried about the amount of time he was spending there when he should be out gathering more wood. He returned to find his truck had been filled by the grateful children. Le Salon in the New Orleans Athletic Club. Trudy is a delight, and just walking through the club is reminiscent of another time. During this visit Trudy also tinted my eyelashes, and the results are delightful. Trudy has a full schedule so be sure make an appointment in advance. Anyone receiving a spa treatment may also use the Athletic Club facilities. I admit I've never been inclined to use my time in the Big Easy in that manner, though. Brunch at The Old Coffee Pot at 714 Saint Peter Street. This place has food, service and ambience nailed. As I bit into my Eggs Sardou, I squealed. I don't squeal. I also never clean my plate, but there wasn't a scrap left on our plates at the Old Coffee Pot. The staff made us feel very welcome, though were scandalized by my yankee friend's insistence that she would be putting sugar on her grits when they arrived. Her grits were so tasty that she didn't even try. Their Bloody Mary comes with at least 3 pickled green beans. I suggest picking up a jar of these at the French Market to take home. Oceana Grill on Conti Street. I stumbled upon this wonderful restaraunt one evening when I arrived before my travel companions. They took me in, fed me and treated me like a friend and I've been coming back ever since. Not once have I been disappointed. I always order the same thing; fettucine alfredo with grilled chicken and a side of vegetables on top. The caesar salad is also a favorite. They do have plenty of Traditional New Orleans fare and after years of taking friends I've never heard anything but praise. We also tried and enjoyed the Fried Eggplant. We learned it's popular with locals when asking about places to eat "My all time favorite place though, is Oceana." Big Al Carson is another Bourbon Street Staple. He plays Tuesday through Sunday at the Funky Pirate. Big Al has a delightful range, singing Blues, Motown, R&B and more and he also has an amazing girth, though I do believe he's lost some of it since my last visit. He belted out "One Bourbon, One Scotch, One Beer", "Stand By Me" and treated me personally to a serenade of "It Hurts Me, Too"
Jamil Sharif at Maison Bourbon at 641Bourbon Street. For the price of a drink per set you get 45 minutes of beautiful old school Jazz. The sound that comes out of his trumpet is like honey and butter mixed together, playing original works as well as old favorites. While there on a Sunday night, the musician spotted this amazing woman walking by and dashed out to ask her to come in and sing. She crooned out "Wild Women Don't Have the Blues." She told me afterward that she worked in a restaraunt down the street and was old and tired. I'm still not sure of her name, but got a little taste that night of what it's like to be in the presence of genuine musicians whose love of their music and their audience is always evident. Every trip includes at least one mistake. For New Orleans 2009 that was taking a Haunted History Tour. If you see a brochure with a vampire on the front, avoid it at all costs. The guides are surly, unknowledgeable and annoying. We left mid-way through becuase we just couldn't take it. There is another Ghost Tour that boasts knowledgeable guides and provides a true history lesson of the French Quarter, sans vampires, costumes, and encouraging people to yell in the streets. The Vampire folks have done a terrific job of making it seem like they are the only game in town, and frankly, I knew better but decided to give them a shot. It won't happen again. The one good thing about the Haunted History Tour is that the tour includes a stop at Jean Lafitte's Blacksmith Shop on the Corner of Bourbon and St. Phillip for a drink. Our guide pointed at the building and essentially said "That place is old, we don't know how old, and it's really haunted. Now have a drink and meet me back here in 15 minutes." I imagine they lose quite a few people on the stop; I can't be the only one that wanted to stay. It's in a quiter section of Bourbon, beyond the noise and lights, so many revelers never make it down this far. There is a reason this place is a favorite with locals and tourists alike. It's easy enough to remain in the Quarter and have a wonderful time, but there is so much to see in the rest of the city. My friends took the street car to the end of the line while I was having a facial. One tip about the streetcar: adult beverages are not allowed, but are more likely to be ignored if you remove the straw. We also ventured out of the Quarter for Sunday Night Football at Cooter Browns, where we feasted on the most amazing "cheese fries". The fries are actually silver-dollar sized slices of potatoes covered in cheese. Washed them down with an Abita Amber. 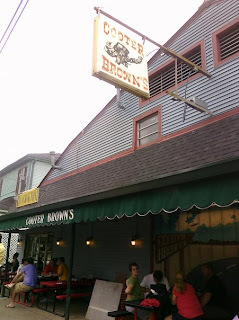 This was my first visit to Cooter Browns, and I will surely return. What always strikes me the most about this city that I love so much is how much they love everyone back. It's amazing that residents of a town so full of tourists year-round never tire of welcoming guests. Their hospitality is never stale. Each time I return, I meet new people and am delighted by the number that actually remember me from previous visits. They always smile such brilliant smiles and greet everyone with a truly genuine warmth. Leaving New Orleans always leaves me a little sad, wondering how I can be so homesick for a place that's never been my home. Kevin explained to us over dinner last night that during Ramadan, hotels are very hard to come by in Indonesia. Apparently it is customary to give the housekeeping staff time off so that they can be with their family, but rather than taking the housekeeping duties upon themselves many opt to move to a hotel. I realize there may be many reasons for this beyond the obvious, but I still find it a relief to know that I am not the only one that eschews housework.